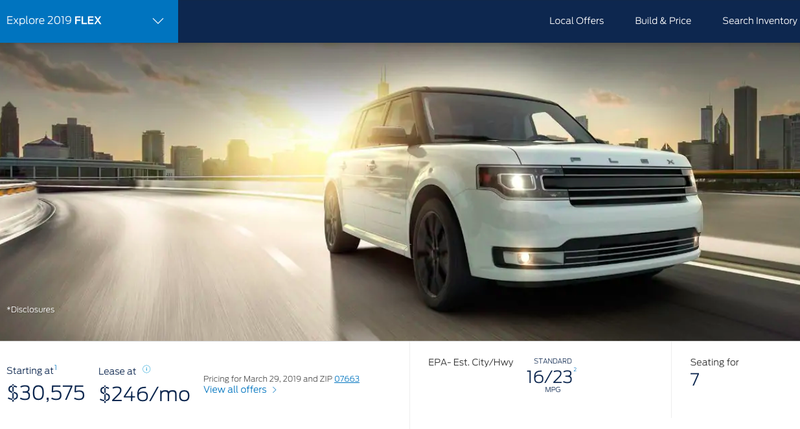 I had sort of assumed that the Ford Flex, a retro gigantic wagon in an age of globular crossovers, had faded into obscurity already. Not quite, as it turns out. Go to Ford’s webpage and (rudely) under the “SUVs and Crossovers” section you’ll find 2019 Flexes still waiting to be freshly delivered to your nearest dealer. For about as much as a blah Ford Edge, you could have a Flex, a longroof that seems to have hopped out of an alternate universe where minivans and SUVs never caught on. Ford Explorer, the Flex asks back to you. That’s a name I’ve never heard. As it is, I’m not greatly surprised that the Flex is largely off everyone’s radar. Ford has committed to letting the car die off in 2020. Get one while you can, I guess, and see if some aftermarket company can put a vista roof on it for the full retro effect.